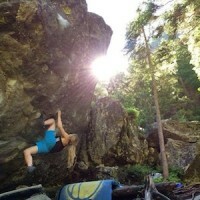 27 Crags has a nice recap of what the kids have been up to in Magic Wood, Switzerland over the past few weeks with the highlight being a repeat of One Summer In Paradise (V13) by 12-year-olds Ashima Shiraishi and Mirko Caballero. Remember when climbing just your age used to be cool? According to her 8a scorecard 11-year-old Brooke Raboutou has done her first 5.14b in Welcome To Tijuana at Rodellar, Spain. This makes her the likely youngest to ever achieve such a grade and no doubt the shortest as well. The 50-foot power endurance route Welcome to Tijuana is a popular first 5.14b as it was Brooke’s brother Shawn’s and Sasha DiGiulian’s first as well. It only took DiGiulian 14 months to make the jump from her first 5.14b to climbing 5.14d, I wonder how long it will take Brooke? ?